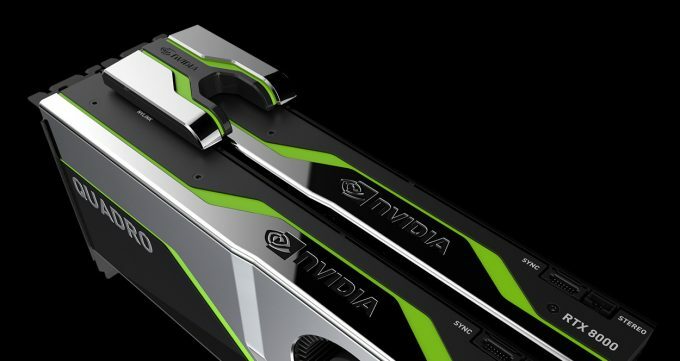 When NVIDIA announced its Quadro RTX series at last August’s SIGGRAPH conference, we were given many reasons to be intrigued. At the forefront, we have Tensor and RT cores, and not to mention a staggering 48GB framebuffer on the top dog, RTX 8000. Something else that stood out was that same card’s price tag: a cool $10,000. Well, that price is no more. In fact, the RTX 8000 has experienced a massive price drop that is perfectly timed for the launch of the new data science workstation platform, which will be picked up by many vendors, with models available very soon (if not right now). As of now, the RTX 8000 is being priced at $5,500, which is almost half of its original price. What sounds better to you: $10,000 for one GPU with 48GB of memory, or two GPUs and a bridge for $13K, with twice the performance and a total of 96GB of VRAM? Currently, the fully unlocked (FP64-wise) Quadro GV100 retains its $8,999 price, and the same applies to the smaller Quadros, like the RTX 5000, and the RTX 4000, which we reviewed last week. At NVIDIA’s ongoing GTC, the TITAN RTX is being sold for $1,999, but we believe at this point that is simply a show special price, and is not reflective of a permanent change (at least, that’s how it stands now).